Service Design and Engineering (SDE) is one of the 7 technical majors offered by the EIT ICT Labs Master School. you want to have an advanced research career in industry and academy. to bridge the gap between Computer Science (CS) and Software Engineering (SE), and between Information Technology (IT) and Information Systems (IS). 1st year at Aalto University/Eindhoven University of Technology/University of Trento - Common base: It develops a common background and prepares the students for all the technical specializations offered in the programme. The courses are related to four main disciplines: Introduction to Services; Complex Systems Architecture; Information Systems; Software Engineering and Development. 2nd year at ELTE - Specialization in Distributed Service Systems: It supports the design, analysis and development of complex distributed telecommunication services. Why choose ELTE for specialization? You can join strong research groups involved in analysing complex systems used in social services, communication networks and services provided by telecommunication software. You can work on large-scale innovative projects initiated by industrial partners, i.e. Ericsson Hungary, Nokia Solutions and Networks Hungary, Telecom Hungary, Cisco and ELTE-Soft. You can experience the lively atmosphere of the Infopark, where the university campus is co-located with the industrial partners. You can enjoy the unique urban culture and vivid nightlife of Budapest with its world famous ruin pubs and exclusive spas. 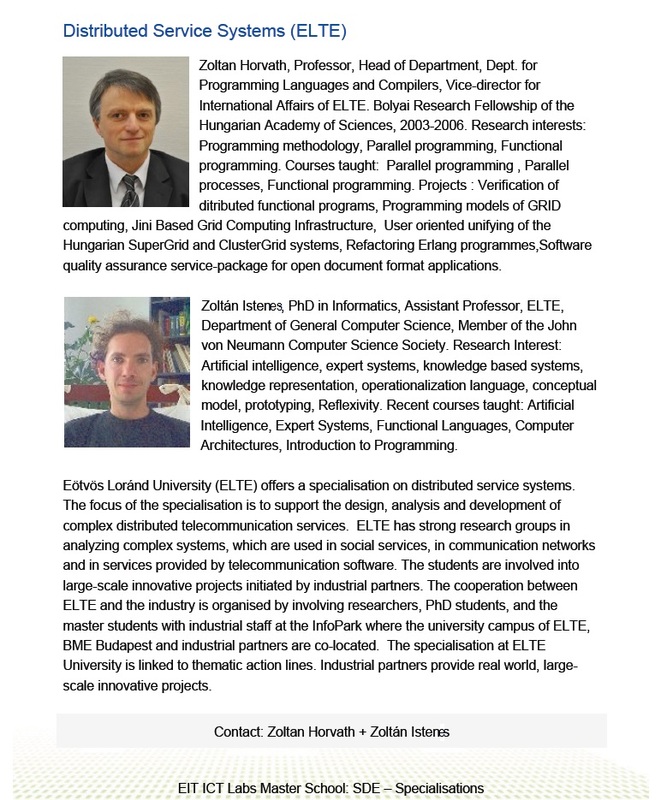 The Major Director is Prof. Zoltán Horváth, Dean of the Faculty of Informatics at ELTE, Head of the Department of Programming Languages and Compilers, Director of the EIT ICT Labs Budapest Associate Partner Group. His research interests include programming methodology, parallel programming and functional programming. His current projects include: Refactoring Erlang programs, Functional Embedded Language for Digital Signal Processing and Parallelism.